Night times are by far the worst time of the day for me. Two girls, two different needs but the main goal is to get them both in bed AND asleep! Ha, yeah right! One night I had bathed both girls and was nursing Hilary just before putting her down. I always ask Lilly to read a book in the doorway of my bedroom so I can see her from Hilary’s bedroom. She loves to read books and is usually pretty quiet. 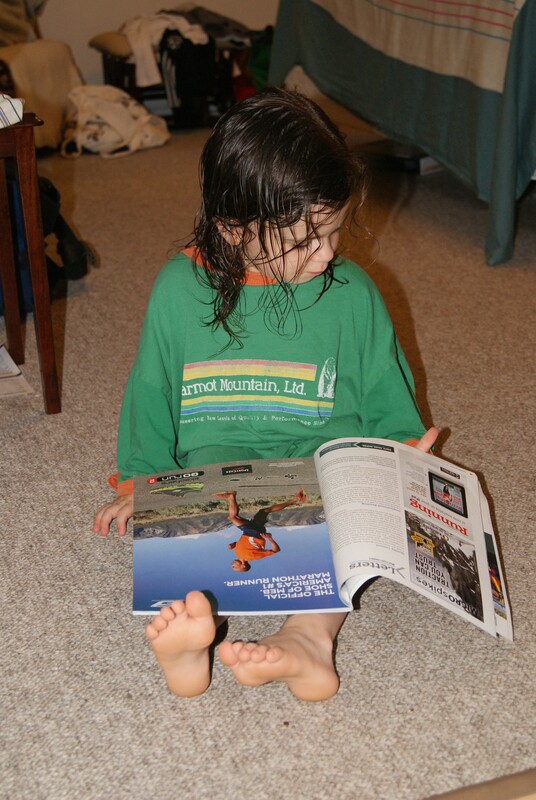 A few weeks ago I “caught” Lilly reading a magazine while wearing her Daddy’s t-shirt as pajama’s. I walked in an asked her what she was doing? She said “reading”. (of course, silly me). She was reading one of Daddy’s magazine’s….Canadian Running. So I decided that night to look through her “chosen book” and each time we saw a women running she would say “Look a Mommy running!” Apparently I have taught her that all Mommies run 🙂 And she did say look a Daddy running too but I was more proud of her calling them all Mommies and associating them with running. I guess she has good role model’s in her life. aaaawwweee, Anna that is so sweet!